Baby teeth begin coming through the gums around 6 months, and that’s the right moment to start, at home, some healthy habits. Brush litte teeth just before bedtime and don’t give any food or drink after that – surely except water or breastmilk, is the most important rules, to consolidate future routines, and to ensure to your kid a great smile. Don’t let your child drink from the bottle all day long, expecially if the drinks are sugary: doing that can lead to decay teeth. Toddlers often swallow toothpaste when brushing, that’s why a lot of expert suggest to introduce fluoride toothpaste when children are old enough not to swallow it. Until your child can brush on his or her own, it will take few years, so you can continue to brush your kids’ teeth not worry about his independence. Teaching good oral habits to your son is one is an important health lessons. Show him the proper way to brush, all the time that he needs. The dental visit is a positive experience, don’t let you – possibile – fear – conditioning your son. Explain to him that the dentist is just like any one else kind of doctor, which helps maintain good oral health. Even the sucking reflex is normal and healthy in babies, in some case there could be medical problems about the growth of the mouth and jaw, and position of teeth, that require an immediate action to stop using the pacifier, especially in cases where the kid is affected by a lot of ear infections or speech and language problems. If you’re trying to help your son give up the pacifier, don’t use negative words or behavior, try positive reinforcement, indeed. Remember that he is only doing what feels natural to him. 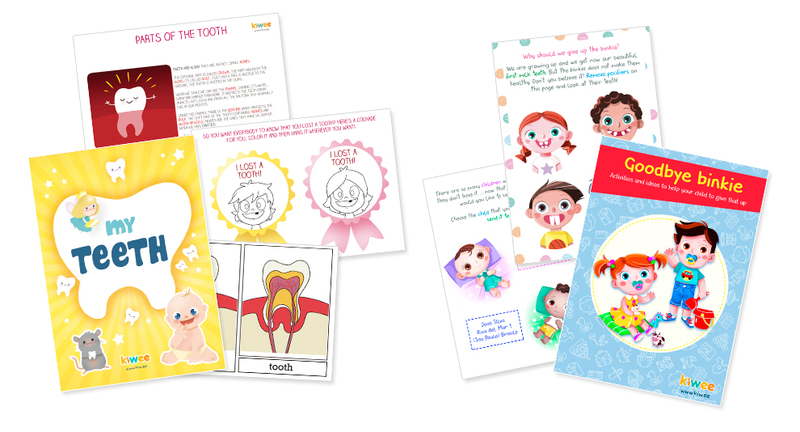 To help you teach your child how to love and care his own teeth, Kiwee Club created for you two specific Activity Books. Activity Book My Teeth, a book that is both informative and fun for happy parents and children: it contains some craft pages to create a tooth box and a door hanger, tooth fairy certificate and 3 parts Montessori cards with realistic images and instructions on how to use them. Children will discover all about their own teeth with interesting information sheets, pre-writing activities, coloring pages, puzzle, robbons, fun facts and illustrations! And for the cases where there are medical problems, we designed a valid tool to help your son: Activity Book Goodbye Binkie, . Warm words and adorable pictures: toddlers will love to read it! Minimize stress, finding fun things to do to leave the binkie and finally being pacifier-free. Share with us your own oral care ideas and suggest!